An IP Address is a unique set of numbers assigned by your router. Each wireless device on your wireless network has to have it's own IP Address. This way the packets of information can reach the right location. It can become necessary to find your device's IP address. For example, if you want to setup a port forward in your router for your PS3 then you need to know the PS3's IP address. 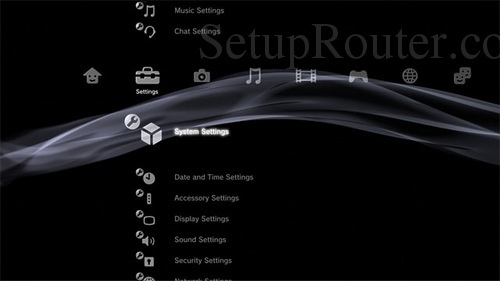 Begin by going to the PS3 Dashboard by pressing the center PlayStation button. Select the Settings option. It will have a Toolbox icon above it. Then go all the way down the list that appears and click the option of System Settings. Once you are on this new page, locate the IP Address. In the example above, the IP Address is the second from the top.